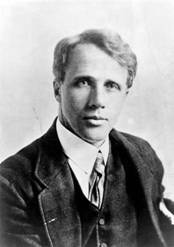 Robert Frost (1874-1963) was born in San Francisco, California. His father William Frost, a journalist, died in 1885 when Frost was about eleven years old leaving the family with about $8. His Scottish mother, the former Isabelle Moody, resumed her career as a schoolteacher to support her family, although she eventually died of cancer in 1900. After graduating from high school Frost held a number of jobs, for example working in a textile mill and later as a teacher. In 1895 he married a former schoolmate, Elinor White; they lived together on a farm and they had six children. In 1912 Frost sold his farm and took his wife and four young children to England. There he published his first collection of poems, ‘A Boy’s Will’, at the age of 39. It was followed by ‘North Boston’ (1914), which gained him international recognition. The poems, written with blank verse or looser free verse of dialogue, were drawn from his own life, recurrent losses, everyday tasks, and his loneliness. When war broke out Frost returned to the U.S. and bought a farm near Franconia, New Hampshire. In 1916 he produced his third collection of poems, ‘Mountain Interval’, which contained such poems as 'The Road Not Taken,' and ‘Out Out.' Frost's poems show deep appreciation of natural world and sensibility about the human aspirations. With his down-to-earth approach to his subjects, readers found it is easy to follow the poet into deeper truths especially because Frost often used the rhythms and vocabulary of ordinary speech or dialogue in his poems. However, Frost’s life was plagued by tragedy: his wife died in 1938 and he lost four of his children, one, his daughter Elinor, died only three days after her birth. His sister and one of his daughters suffered mental breakdowns, and his son Carol, a frustrated poet and farmer, committed suicide. Frost himself also suffered from depression.